Matthew Hagee is the spawn and aide of deranged lunatic John Hagee and responsible for much of the televangelism perpetrated by John Hagee Ministries. Matthew is deranged as well. - The 2013 DOMA ruling is a sign that “the rapture of the church is about to occur” (i.e. “send us money”) since today all of the same things are taking place as occurred during the days of Noah, such as men being wicked and atheistic, and during the days of Lot when “men had given up the natural affections for women and were lying with other men.” (Marriage equality also “kills capitalism” – which I guess is a rather trivial corollary of it bringing about the end times). - The 2013 Navy Yard shootings were a sign of the end times, and possible military action against Syria could lead to World War III, and thus the fulfillment of Jesus’ assertion that “you will hear of wars and rumors of wars” as the End Times approach, since wars and rumors of wars are a new thing. - Climate change is a myth because it contradicts the Bible, and therefore a sign of the end times (no, we cannot really make sense of it; don’t blame us). Instead of caring about the environment we should tell people about Jesus. 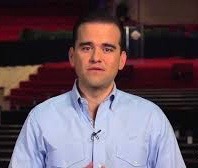 As a response to the woes of society of present – with civil rights and the separation of church and state and all that – Matthew Hagee recommends more dominionism, and to achieve this Christians need to use “spiritual violence” (whatever that is) – in America at present secularists have “become violent with people of faith” (apparently meaning that not everyone subscribes to the same doctrines as Hagee and gay marriage is legal – according to Hagee, Christians are soon going to be declared “enemies of the state” and thrown in jail, or worse), and Christians need to fight back: “There is a value in spiritual violence,” since it will … prevent or postpone the end times? Wait, that can’t be it, can it? One of the oppressive, ungodly tactics of secularists is science, and in particular science education: science, English, and math are only ungodly if they are not taught from the perspective that “God is the source of all knowledge,” but “whenever you use science to teach the deception of evolution, that’s ungodly”. Evolution, according to Hagee is a “lie from the pit of hell” and has “cost us 55 million Americans” since it is to blame for legal abortion (he doesn’t explain). It is also to blame for the uproar over Cecil the lion’s death, which is ostensibly of the devil as well. As Hagee sees it, schools have been telling kids “that we were the highest form of a scientific process called evolution. ‘There’s just one little chromosome between us and Cecil the lion.’ Thank God for that chromosome, because it gave me a finger and I can use it to pull the trigger.” It seems that Matthew Hagee must have skipped that day when they explained evolution at his school, and that this wasn’t the only class he missed. Apparently he has also been involved in the construction of another Noah’s Ark replica in San Antonio; though it is somewhat scaled down (a “two-story ship with 16 life-sized passengers,” including a giraffe), it cost 5 million and “aims to spur wonderment but also to underscore the Bible’s authenticity,” said Matthew Hagee. It even got real animatronics! “You’d be hard-pressed to find any church with animatronics,” said Michael Chanley, executive director of the International Network of Children’s Ministry. How could it (as opposed to words) fail? Hagee is, of course, also an advocate of faith healing. Indeed, he claims that healing in Jesus’s name always works: Sometimes instantaneously, other times over a longer period … and sometimes the person dies, “but that does not mean they’re not healed.” As he reminds us, “The Bible says that when we get into presence of God that every sickness, every infirmity, and every kind of weakness is gone, which is an absolute and total healing.” Just think about it. Sometimes, though, Hagee suggests less lofty and abstract tools to counter societal ills. For instance, to prevent mass shootings he has suggested that we should just outlaw video games. He agreed with radio show host Trey Ware that we also need “common sense gun control”, which means that we need to “repeal a lot of the restrictions on the Second Amendment” and “outlaw the gun-free zones,” and helpfully offered the 1890 massacre at Wounded Knee as an example of the dangers of gun control. As for gay marriage, it doesn’t only usher in the end times (and kill capitalism); it also destroys our ability to survive because it undermines the family and is a tool of Satan. Indeed, gay marriage is apparently so silly that, according to Hagee, “people who are educated cannot look at two men married and say ‘that’s right’”. But then, Hagee presumably has a pretty eccentric idea about what “educated” means. Diagnosis: It’s another John Hagee, only more deranged and less sympathetic. Yeah, it’s pretty bad.